I hope all my friends in the U.S. and Canada enjoyed their holiday weekend. This is what happened around Twisty Lane. We were about six weeks late, but it's never too late to celebrate. We went to Little Liberty. 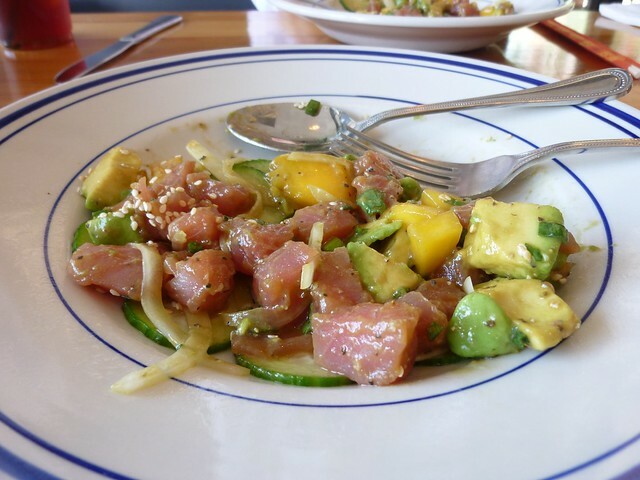 with tuna, tamari, cucumber base, mango and avocado. Delicious and it all was on my diet! 2. I finished reading Clammed Up (A Maine Clambake Mystery) by Barbara Ross. A good read for the 4th of July weekend. Clammed Up is the first in the series. I thought it was amazingly good for the first book in a cozy series. Clambakes, Murder and Recipes -- what more could one want??!! 3. I was ready for the 4th of July. 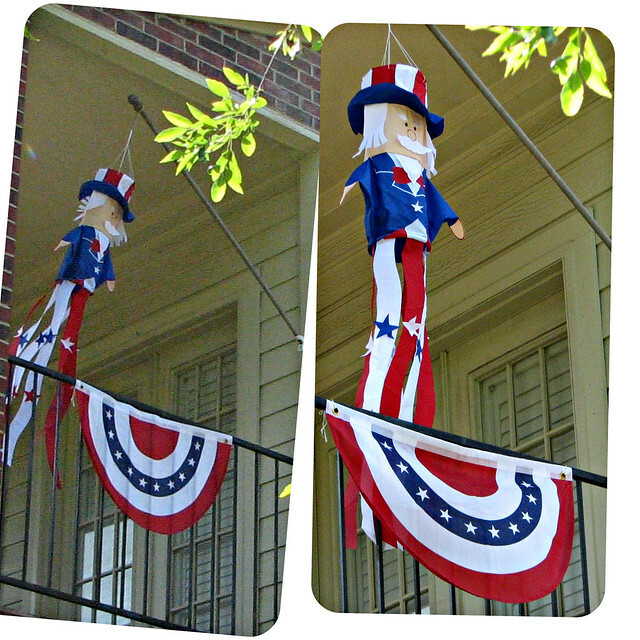 Uncle Sam was flying high over the bunting clad balcony. 4. I made a quick trip to Ross. It's right next door to Michaels (more yarn). Sometimes I find something, sometimes I don't. I found these kitchen towels. I watched all the fireworks at home on tv -- switching between channels. No way was I going out in the heat, humidity and crowds. 5. Several of you wanted to see the crochet lovie blanket. I finished one of the owls and have a panda started. All finished in time for the baby shower. Great July 4th décor. Loved the crochet blankie, a great pattern. Every day should be a celebration! Glad you celebrated the 4th your way, lunch with friends and fireworks on tv sounds good to me. Your Uncle Sam and the bunting were just the ticket. Love your Uncle Sam windsock and bunting! Sounds like you had a lovely lunch out with friends. That owl blanket looks so cute. Who can resist a visit to Michaels? They always have such great sales and coupons! Great 4th of July decorations! Lovely crochet project! Nice day out too! Looks like you had a nice Independence ay as well! I loved uncle Sam. He's too cute. Whereever did you find him? And, those nice towels...and I am not forgetting that darling little baby gift. I just looked at it all.... well, maybe not so much the raw fish salad. I am a bit (maybe a lot) squimish. Can't wait to see what you do for next week. That little blanket is adorable! Your July 4th decorations look nice with Uncle Sam dancing on the wind. When I looked at your lunch, I thought that was raw fish, not sure I could eat it but know you enjoyed it, and the company of your friend. A sweet owl lovie basket, make sure you show us the panda! Fun times - great decorations and cute blankie. Sounds like you've been busy. That lovie is so cute!! Lovely 4thof July decoration and I must say I love that little owlie. I like raw fish.Your dish is tempting me. I think I need a glass of wine now! That little blanket is so sweet! Happy new week to you!! I love tuna...that looks delist! 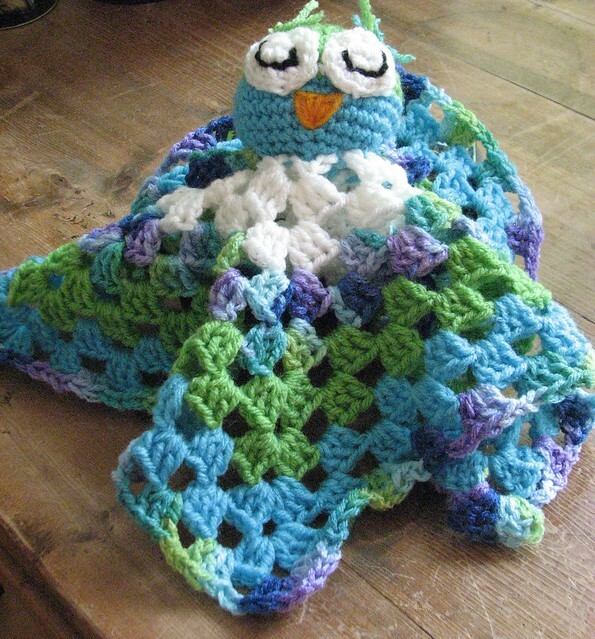 Your love crochet owl is so cute! I certainly wish we had a Few stores closer...we do have a Ross but very small, and it looked quite empty last week...hope we aren't losing that! So glad you had such an extended birthday! While I have never tried to crochet a lovie, I enjoyed seeing what you have made...ready to be cuddled! That blanket is really cute! Glad your holiday weekend went well and thanks for sharing. Sounds like a perfect time - good food, a cozy, being with family and friends! What a fun post, so many lovely things. And Little Liberty did you proud - lunch looks delicious. love the 4th of July decor! 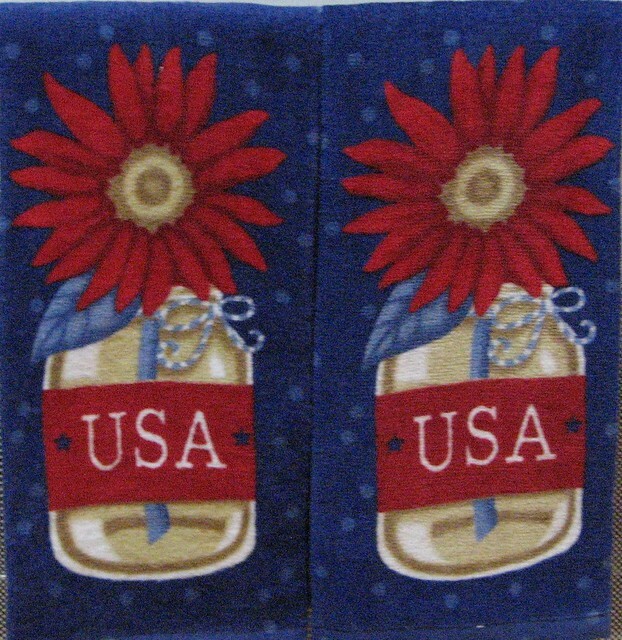 Love your patriotic balcony and the adorable lovey. So nice visiting! Your owl is adorable! Great work. Thanks for sharing at Home Sweet Home! the lovie blanket turned out so cute! i love how you decorated for the 4th..we didn't get to see fireworks this year. on the 4th they were rained out and a makeup day was scheduled but i still wasn't feeling well with that sinus infection :( thank you for linking to willy nilly! !